The Red Wedding and other harsh realities. Maybe this is all just part of growing up. Maybe this is just our generation’s way of discovering that life isn’t fair, and that the bad guys can win. There’s nothing, in the end, to stop them except other people. And other people have failed before. It’s not like that many of us have known true despair or loss. Some of us undoubtedly have, and are stronger for it. And I imagine if you have, you’ll know who you are. But if you, like me, have had the good fortune to grow up safe and affluent in the Western world, sheltered, secure, and alive at the end of one of the longest periods of peace in our history, you, like me, probably don’t know what real despair means yet. 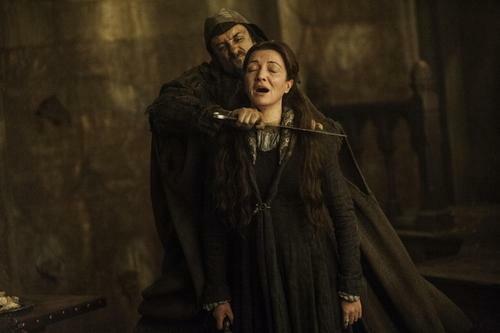 Odds are you, like me, have to confess that something like the death of Robb and Catelyn Stark can cut like a knife. Other generations had essentially anecdotal evidence for their fixations and collective experiences. They were real, and are easily remembered, but It was hard to tell what the collective mood on any given subject was with any certainty. Not in the detail we can now. But Game of Thrones has wounded the collective psyche. We have empirical evidence that it has. Real data documenting the visceral gut reactions of people across the world to a fictional event. And it would seem that we don’t know what to think of a world where that kind of brutality, savagery, and cruelty is possible. There is a worry at HBO that the series will suffer in the ratings from this. That people will simply withdraw from the series to take away the emotional pain it seems to have genuinely caused. Because there are no certainties now. No way out of the despair and bleak cruelty of the world Martin has created. (One that is powerful because it is devoid of all traces of the sentiment that cloys a lot of fantasy, and fearlessly holds a distorted mirror to our broken world.) As it was succinctly put by Tasha Robinson, “Robb and Catelyn were the last appeal to adult authority, the last illusion that someone sensible and severe could come in and take charge.” It’s as though Jack butchered Ralph, and the naval officer never came because the world outside had descended into nuclear war. I remembered that feeling last night. That sinking, vertigo feeling I’d had before Golding’s Deus ex Machina in Grade 10, the suspicion that Ralph was a goner, and that there was a beast at the heart of human nature, waiting to claim us all. And I remembered how it had lingered for days afterwards. The suspicion that I had learned something fundamental and cruel about human nature, that no amount of authority was going to dispel. Then, it faded from my mind, and life went on. Now, I’m not so sure it will, or that I even want it to. Not in the same way, anyway. Because that beast IS out there. Tearing at the eviscerated streets of Aleppo and Qusair, stalking the mountains of Afghanistan, patrolling the halls at Guantanamo Bay or staring balefully out over Tienanmen Square. Mao, Stalin, Franco, Kim-Il Sung, Kissinger, Assad, Putin, Chavez or Cheney; sometimes we forget that some despots die in their beds, and that some evil goes unpunished, and even celebrated. Adulthood so far seems to consist of hard truths learned. Harsh, brutal truths that no one can possibly tell you, because no one can explain them to you in a way that you’ll understand. This particular entry is as much for me as it is for you. It’s a call to future me to realize that life isn’t going to get any easier, and problems infinitely bigger than the death of the Stark family are coming, and there’s no certainty at all that any of them are going to end well. Because in the end, there’s no one to save us from ourselves except ourselves. And we should probably get on with it.